L and I were originally inspired to write a blog when we started trying a new waffles recipe every weekend. We envisioned a blog all about waffles… and, well, we thought that would be a little boring. Hence the name More Than Just Waffles was born. L’s sister recently requested a Breakfast Birthday Party so we thought we’d try out our yeast waffle recipe from Waffle Recipe.com and bring you a waffles post to make our namesake a little more relevant. The recipe is pretty simple - mix your dry ingredients. 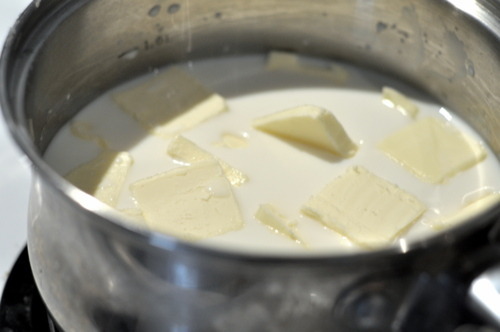 Melt the butter into the milk over the stove. 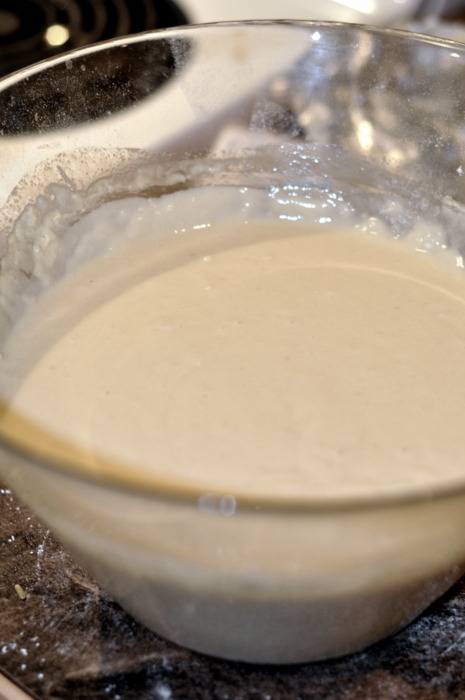 We recommend cooling the milk in the fridge for a few minutes before adding the yeast. If you scorch the yeast it will die (poor yeast!) and your dough will not rise. 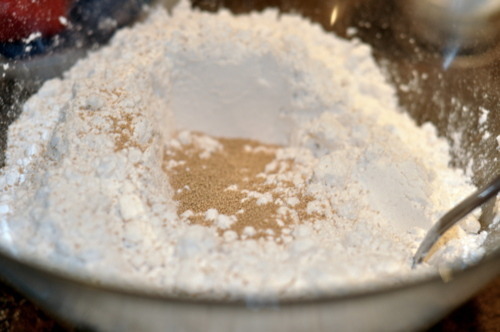 Then mix your ingredients together and place in the fridge to rise. The next day your dough will have doubled in size. Heat up your waffle iron and place half-a-ladle of dough in each section. Be ready for the dough to spill everywhere if you add too much! 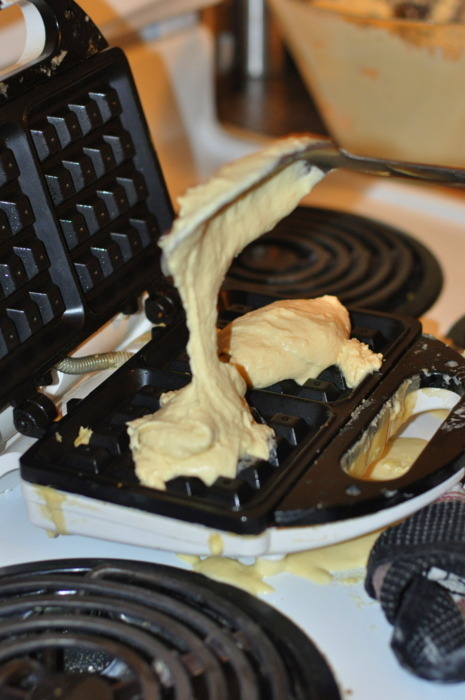 We usually put a plastic sheet under the waffle iron to make cleanup easier (we forgot in this case though!). We served them with hand-whipped cream (yes HAND whipped - my hand blender over-heated when I was making the butter-cream icing last week and I didn’t realize this until it was time to make the whipped cream! Hand whipping is not recommended), strawberries and raspberries. 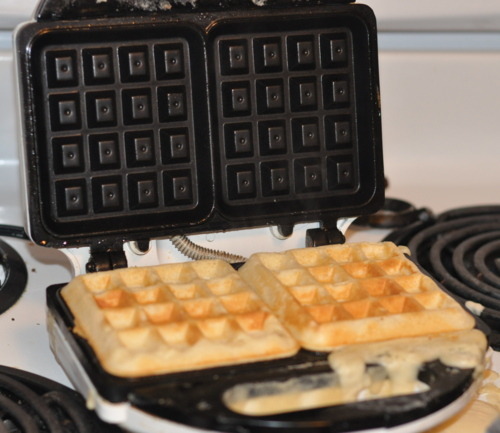 We loved the waffle iron Phil brought! It made belgian-style waffles and even had an light to indicate when the waffles were done! (You would think this feature would be standard!). Sorry I didn’t get a picture of the finished waffles with the toppings! I was a bad food-blogger! What’s your favourite breakfast treat? More Breakfast Birthday to come soon!